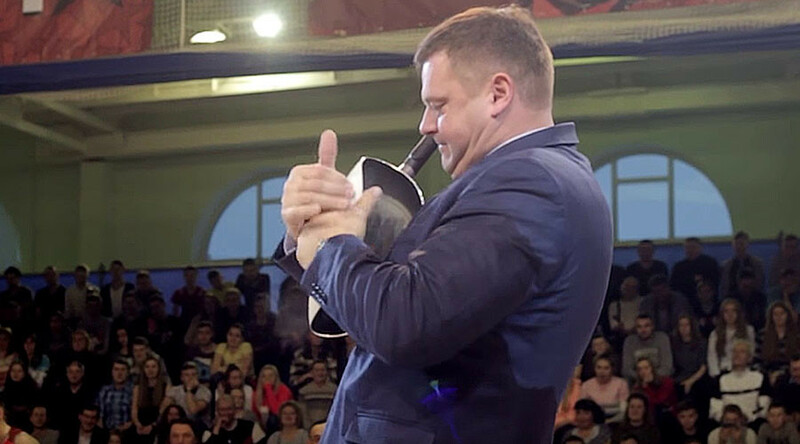 Eight-time Guinness Book of World Records champion Alexander Muromsky shows off his skills by bending a frying pan into a roll with nothing but his bare hands. This impressive stunt was performed at youth basketball games in Oryol, Russia, some 360km southwest of Moscow. Here’s an older video of Muromsky scoring his 8th Guinness World record by bending 11 metal rods, each 12mm (half an inch) thick, on his head in one minute. Muromsky is part of a group of Russian patriots called the Russian Bogatyrs. The term itself comes from medieval Russian folklore and describes a sort of save-the-day knight, most often gifted with superhuman strength. The team performs at various events, wowing crowds with their muscle power.